If you feel like lasagna, this mini meatloaf lasagna is the right thing. It really tastes like lasagna! Do not you have the time to make the mini meatloaf? This recipe can be cooked like a regular meatloaf. Heat the oil in a small pan. Cook the onion and garlic until soft for at least 5 minutes. To defrost frozen spinach, put frozen chopped spinach in a fine strainer and run hot water on it until the spinach has thawed. Press the spinach with your fingers to release as much water as possible. Scrape the spinach out of the filter in the middle of a thick paper napkin (or two thin paper napkins) and fold the paper napkin over the spinach as a package. Squeeze over a sink to remove all the remaining water (unlike a cloth towel, spinach does not stick to paper towels). 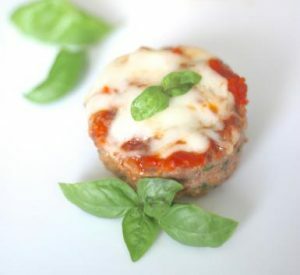 In a large bowl, use your hands to gently combine the onion and garlic, spinach, minced meat, eggs, 1 cup of marinara sauce, breadcrumbs, basil, oregano, salt and 1 cup of grated mozzarella. Mix the mixture in each cup of the muffin pan, pressing with your fingers to flatten and level the tops. Spread the remaining marinara sauce on top of each (about 2 teaspoons for each meatloaf) and then sprinkle the remaining grated cheese on top (this is optional and makes it look more beautiful).